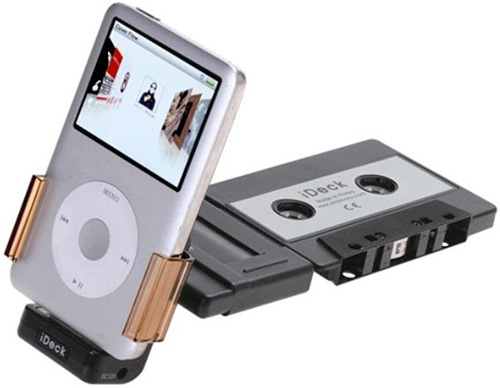 iDeck iPod Car Cassette Adapter And Dock | OhGizmo! By Andrew Liszewski on 05/24/10 • Leave a comment! There’s been an odd resurgence of cassette tape related gadgetry recently, but the one place where they definitely still have a strong presence is in older model cars. FM transmitters seem to be one of the more popular solutions to using your iPod with an older car stereo, but dealing with interference and finding an open frequency can be a pain. Not to mention those FM radio waves can’t be used as a dock for your iPod either, an advantage that clearly goes to this iDeck cassette adapter accessory. When the cassette end of the adapter is inserted into your car’s stereo it provides enough support to hold nearly all of the more recent versions of the iPod Classic, the Nano and the Touch (no iPhone support is mentioned anywhere) and while an included cigarette lighter adapter is included, it’s not needed if your iPod has enough juice to last the trip. The adapter also has a jack allowing you to connect any audio source via a 3.5mm audio cable, and the only caveat I can find is that the cassette doesn’t rotate to accommodate the more common horizontal tape slots. $37.99 from NewEggMall.